Emmanuel’s church, established in 1723 continues to grow and serve in the loving grace of Jesus Christ. 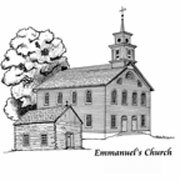 On this page, you are invited to explore the long history of Emmanuel’s Church. Every generation should have a basic understanding of it’s history. History allows a blueprint for the present either to use as is or create a different plan for the future. We either repeat the same mistakes or learn from our mistakes and create a more productive future. The same holds true for a church history. For the rest of the overview we will refer to the Emmanuel’s Evangelical Lutheran Church as simply the Church. The original inhabitants came from the Palatinate region, which was a fertile pocket of land in the upper Rhine located in Germany. A group of German farmers learned of a new land which was very special. What was so special about this land, was there a person could worship as he or she believed. This was very different from the way it was in Europe at that time. There they were told how and when to worship. These people would eventually be known as the Pennsylvania Germans or the Pennsylvania Dutch, (a name given to them by their English speaking neighbors). Their dialect is still spoken today. They brought with them Bibles, a deep religious feeling about life, and music that was a part of their everyday devotion in their churches. These feelings and devotions with music still influences our church services today. We now come to the question of how and why did they settle here at Emmanuelsville? Let us first discuss the date 1723. Some historians will argue there are no church records or tombstones with proper dates, therefore, the given date is not acceptable. On the surface this may seem to be a correct assumption, however, when one researches other records of the past a few interesting things show up. We find that in 1722, Governor William Keith of Pennsylvania traveled to what is now called Albany, New York to invite Palintine settlers to move to Pennsylvania and settle on it’s fertile soil. This was done to gain population in the area because of the dispute over the land boundaries between Connecticut and Pennsylvania. It also was done to strengthen the hold over the native Indians in regards to their land disputes with the white man. The native tribes of the area we are talking of were the Lenni Lenape or the Delaware Indians. This was a name given to them by the white man. The governor invited these people to settle in Pennsylvania without the permission of the authorities in Philadelphia, and certainly without the permission of the Indians. To keep peace and harmony between the white man and the native Americans, William Penn started the policy of buying the land from the Indians before allowing any white people to settle on any land. The authorities in Philadelphia were now faced with a serious problem. If they turned away the German settlers which were invited by the governor they would do an injustice to the settlers which they needed very much. The authorities decided the easiest thing to do would be to exert strong pressure on the Indians and obtain their lands. These recorded set of circumstances help us to understand why they may have come in 1723. While it is acknowledged that it is not written in a church record book, it is a matter of record in the Pennsylvania Archives. The next set of questions we should turn our attention is who where they and how did they get here? According to an article ” Incident at Tulpehocken ” written in the Pennsylvania History, vol.35, no.4, October 1968, pp. 335-355, there were fifteen families that left the German settlement of Schohaire. That settlement was approximately forty miles west of what is now known as Albany in the state of New York. They settled in an area of Pennsylvania known to the Indians as Tulpehocken. Also found in the 1903 history book published by General Council Publication House, 1522 Arch St. Philadelphia, PA. titled ” A History Of the Lutheran Church in Pennsylvania (1638-1820) ” , the book tells of the travels of a group of German settlers who came from New York State and settled in Tulpehocken with thirty-three families. This a difference of eighteen families. The Indian name Tulpehocken means, “Place of the Turtle”. This was a valley which got its name from the largest Indian village of that area. In ancient times it was the hunting grounds for the Delaware Tribes. It ran from the South Mountain to the Blue Mountain and from the Susquehanna River to the Delaware River. It is conceivable that the group of settlers split into two groups and settled two different settlements. One group calling their settlement Tulpehocken and the other group calling their settlement Emmanuelsville. Both of these settlement are within the boundaries of the Indian valley known to them as Tulpehocken. When one looks at the records of the family names of the New York area and checks the old family names of the Emmanuel’s church records and old tax roles, there are some family names which are found in both area records. These family names can still be found in the Emmanuelsville area today. These names are Miller, Beil, Becker, Schneider, Schaeffer and many more. There must be more research to prove the connection but there is a common relationship. Still another possibility is that they came down the Delaware River from a settlement near Stroudsburg called Minisinks. This settlement was named after the Indians who lived in the area. In this area lived a tribe of Indians called the Minsi which means, “People of the Stony Country”. The settlement of Minisinks was found on the west bank of the Delaware River near Stroudsburg. The settlers who founded the settlement were miners. These miners built a road known as the, Mine Road, up into New York to deliver the minerals they mined for market. It is possible the early settlers used this road to reach the area they called Emmanuelsville. While these are recorded accounts they still have to be researched in much greater detail before we can say exactly how the first settlers came to Emmanuelsville. Artists conception of original church and log cabin. The original church was a log cabin, built approximately two-hundred feet southeast of the present brick structure, some time between 1723-1733. The deed of 1765 mentions a school house and church. This means a school was originally built between 1733 and 1765. The oldest readable tombstone has the date of Feb. 14, 1760, however, the settlers in all probability used wood for the tombstones and buried the loved one on the family homestead so the dates could go back even earlier but we have no way of proving this. The oldest existing church record book was started in 1763. It is hand written and was signed by the pastor, John Andreas Frederichs. A possible reason that no earlier church record book was found could be they used the custom of burying the valuables and lost their location over the years. A new schoolhouse was built some time between May and December 1822. It was made of logs and masonry and stood on the site of todays sexton’s home. During that period of time the schoolhouse was called a, College. Back then it simply meant a place of learning. The old log cabin church was in very poor repair at this point in time that no church services could be held in it. Because of that, services were held the schoolhouse between 1776-1850. During this period of time the congregation became known as “The Old Schoolhouse Congregation”. Another underlying reason the church was not rebuilt in this time period was there was not enough resources available. For in the 1770’s and 1780’s groups of our congregation united with other settlers and built other churches in the area. These churches were Stone Church at Kreidersville; Salem Church at Moorestown; and Little Moore Church; and St. Paul’s at Indianland. But in 1850, a new brick church building was constructed. The cost was $3,244.73. The congregation named the church “Emmanuel’s Church “, which means, “God is with Us”. This structure is still in use today. In 1879, a new schoolhouse was built out of brick with a corner stone reading ” Emmanuelsville Seminary 1879 “. In 1903, the cement sidewalks where installed along side of the church. Some time in 1910 the existing pipe organ was installed and surprisingly, half the cost was paid for by Andrew Carnegie. We believe this was through some sort of grant. During the years between 1910-1953 the church was maintained and kept in good repair. Examples of this are kerosene lamps were replaced with electric lights and existing pews which did not have a center isle were replaced with pews that did. These were more pleasing for weddings. Then in 1953, the corner stone was opened and a tin box was found. The tin box was placed in the corner stone on October 10, 1850. The box contained one German bible and two catechisms, one Lutheran and one Reformed. There was also found a document which was in very poor condition. The document was taken to the Pennsylvania Historical Society in Philadelphia to be restored. Only part of the document was salvageable. It is believed to have been a church history written by hand in German. We have not been able to find a copy as of yet, for the original was sealed back up in the corner stone. From 1954-1964, the church building stayed the same still being well maintained . 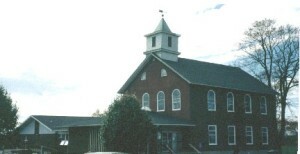 In 1965, remodeling was done to the church. The congregation voted and installed bathroom facilities. Also, Christmas candle light services were held for the first time. In 1966, the Altar Guild met so they could clean and store the antiques of the church. The congregation also that year elected representatives for the incorporation of the church. On January 8, 1967 the present church constitution was adopted and a new hardwood floor was installed in the church, a gift from the Harold Beil family. The year 1968 was a year of great change for the church, because up until this year Emmanuel’s Church was a union church. This year both congregations voted to go their separate ways. The effective date of consolidation was January 1, 1969. The building was now a church of the Lutheran Congregation alone. Remarkably it was a very smooth transition. A lot of the Reformed Congregation simply changed over to the Lutheran Congregation. 1973 was a milestone year for the church. The addition was finished and then dedicated on June 17, with a grand celebration held to mark the 250th Anniversary of the founding of our church. From 1974 till the present the structures have remained basically the same in size. The interior and exterior have been well maintained. Some of the interior rooms have been renovated to service the growing needs of the congregation and community. This has been only a short overview of the history of our church. Please understand if a piece of history was omitted. What can be concluded from this short overview? We can conclude that Emmanuel’s Church was founded by settlers in 1723, and still is serving the community, wishing with Gods grace and blessing to grow in love and service to Christ and all people. Wishing to be blessed together with word and sacrament and to be united as a congregation in the common confession, defense, and propagation of our faith in Jesus Christ as our Savior. with Pride in our past, Faith in our future, and knowing God is with us all.